Jones Eyecare in Oklahoma City, Oklahoma is conveniently located in South Oklahoma City just off of 74th and South Shields, near Walmart Super Center and just across from IHOP. Our Oklahoma City office opened in January of 1994 near Crossroads Mall. In 2003, we moved to our current location at I-240 and Santa Fe in front of Wal-Mart. Most of our patients are from the south Oklahoma City area, but we are proud to say that we have many loyal patients who travel hundreds of miles for our expertise in eye exams and contact lens fittings. We provide the following goods and services at our Oklahoma City office. Comprehensive eye examinations which include glaucoma and cataract screenings. Dilated eye examinations to check for eye disease including diabetic and hypertensive retinopathy. Contact Lens examinations and fitting. 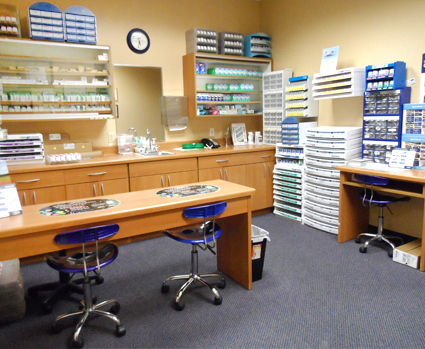 We fit all major brands of contacts and specialize in hard to fit contact lens cases. We offer contact lenses for astigmatism, bifocal contacts and rigid gas permeable contacts and well as colored contacts and soft disposable lenses. We now offer safe and convenient online reordering of contact lenses through our website. info. I didn't know I needed to know. Thank you so much. friendly. Looking forward for my other children coming here! easy to do, loved it! I brought both my younger children in and was amazed with the staff as well as the Doctor,he was quick,informative and efficent. I would recommend to all.